Whey protein has the highest biological value of all proteins. Biological value is used to rate protein based on how much of the protein consumed is actually absorbed, retained, and used in the body. One of the key reasons why the biological value of whey protein is so high is that it has the highest concentrations of glutamine and branched chain amino acids (BCAAs) found in nature. These amino acids are critical to cellular health, muscle growth, and protein synthesis. Our experts at Nature’s Lab® highly recommend consuming whey protein powders in smoothie form, mixed with other highly nutritious foods. Whey protein powders come in various flavours such as vanilla, chocolate, strawberry, white chocolate, caramel and lots more. There is literally a flavour to match most people’s tastes, making it extremely versatile in its use. Weight Loss: Studies show that whey protein is more effective at aiding weight loss when compared to other forms of protein. It does this by suppressing appetite while boosting metabolism. This flies in the face of what most people think about whey protein supplementation. Yes, it does build up lean muscle mass but burns fat in the process. Lowers LDL (bad) cholesterol levels: When used long-term, high-dose whey protein supplementation may lower cholesterol levels.In one study in overweight individuals, daily consumption of 54 grams of whey protein for 12 weeks, led to a significant reduction in total and LDL cholesterol. Enhances Antioxidant activity in the body: By promoting the formation of glutathione, whey protein supplementation may strengthen the body’s antioxidant defenses. Antioxidants are substances that act against oxidation in the body, reducing oxidative stress and cutting the risk of various chronic diseases and glutathione is one of the body’s main antioxidants. Helps fight chronic inflammation: High doses of whey protein have been shown to lower serum levels of C-reactive protein, suggesting that it can help reduce inflammation. Chronic inflammation is not only harmful but is also a risk factor for many diseases. A large review study found that high doses of whey protein supplements significantly reduced C-reactive protein (CRP), a key marker of inflammation in the body. Helps treat Type-2 Diabetes: When taken before or with high-carb meals, whey protein has been found to be effective at moderating blood sugar levels. It may be particularly useful for people with type 2 diabetes. It moderates blood sugar levels by increasing both the levels of insulin and the sensitivity to its effects. 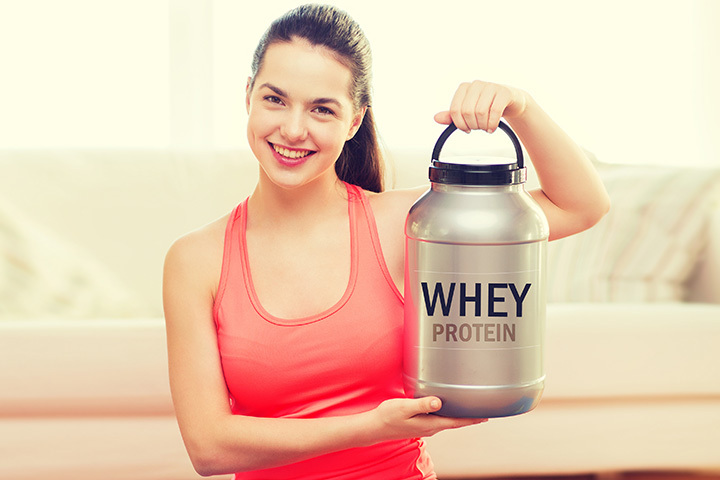 An excellent source of high quality protein: Whey protein is one of the best dietary sources of high-quality protein. It has a very high nutritional value, is highly digestible, and absorbed quickly compared to other proteins. A great way to build lean muscle mass: When combined with strength training, whey protein is excellent for promoting muscle growth and maintenance. Muscle mass naturally declines with age and this usually leads to fat gain and raises the risk of many chronic diseases. Whey protein is effective for the prevention of age-related muscle loss, as well as for improved strength and physique. Helps with high blood pressure: In people with hypertension, whey proteins may be beneficial in controlling blood pressure. This effect on blood pressure may be due to bioactive peptides called lactokinins. Several animal studies have demonstrated their beneficial effects on blood pressure. Our experts recommend consuming no more than 25-50g (1-2 scoops) of whey protein powder daily as the body can only utilise a limited amount of protein at a given time. Consuming more would be pointless as it will simply be excreted from the body. For lactose intolerant consumers, Nature’s Lab® experts recommend whey protein hydrosylate or isolate over the concentrates. Individuals with a history of liver or kidney problems should consult their doctors before taking any form of protein supplements. To see our range of whey protein powders, kindly visit our online store.